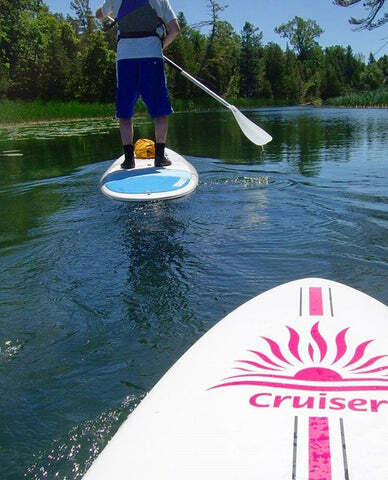 Paddleboarding is an activity that anyone can enjoy, in almost any body of water. However, like any sport or activity, following a few basic safety guidelines will ensure you safely make it back to shore each and every time. Know your water and weather conditions - check the weather before going out, paying attention to things like wind speed, direction, and changing weather patterns. Avoid paddling in stormy conditions which is especially important in the non summer months when weather changes can be more dramatic If you are paddling into the wind, or know it will get windy, do the upwind section of your paddle first when you have the most energy. If paddling in the evening, know the time the sun will set and plan to be back to shore before the sun drops below the horizon. Have a float plan - A float plan sounds fancier than it actually is. Basically - let someone know where you are going paddling, when you are going paddling, and when you will be back. A courtesy to the person that knows your float plan is to let them know when you are safely back to shore. As part of your float plan, you should know the route you will take, and how long it should take you under normal conditions. If possible, paddle with a partner or in a group. Leash - Wear one. Period. In surf or rougher waters, a leash is a piece of equipment that you must wear. In surf, not only do you endanger yourself if you get separated from your board, but you also endanger anyone in the path of your board as it gets pushed in towards shore by the surf. In rougher waters or windy conditions, falling happens more often and it doesn't take much for your board to get away from you. However, even in flat calm water, a leash just makes sense to wear. The best flotation device possible is the giant board that you are riding, however, when you are separated from it, things can go from bad to worse quickly. Know what to do if the unexpected happens - things can change in terms of weather, your energy levels, as well as your equipment. The best advice is to not paddle further from shore than you would be able to swim. If you become too tired to paddle standing up, kneel on your board to give your legs a rest. If something was to malfunction with your paddle and you were not able to use it - don't forget you have 2 built in paddles on the end of each arm. Lay down and paddle yourself back to shore. Know your limits, and paddle within them - SUP can be a great workout, both for your cardiovascular system, but also your core. However - like any exercise, know your limits. If you haven't paddled further than 2 miles yet - likely heading out for a 10 mile paddle is not the greatest plan. Remember that as far from the beach that you paddle in one direction, you have to paddle back. Keep yourself hydrated and fueled, just like you would in any other sport. 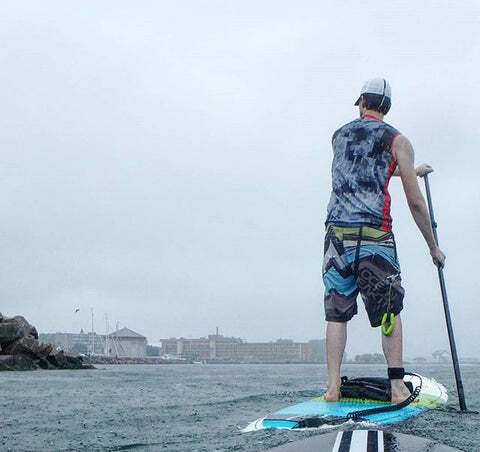 While this is not a comprehensive list of all things SUP safety related, following these guidelines will give you a great start to being the safest SUP'er you can be!